DEIGO is one of the devices from the TYROSOLUTION by TYROMOTION. 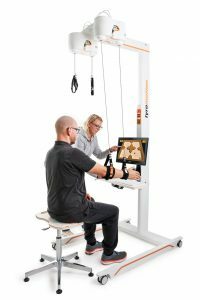 MOTIONrehab is unique as it is the only private rehabilitation company in the United Kingdom to have the complete TYROSOLUTION under one roof enabling high-intensity rehabilitation for all phases of neurological rehabilitation. 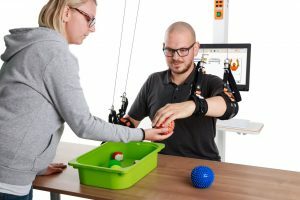 The DIEGO is a robotic-assisted device that removes the effects of gravity on one or both arms. The ‘Intelligent Gravity Compensation’ is designed so you can replicate the three-dimensional (3D) movements used in daily activities. DIEGO’s comfortable arm straps allow for a fast and correct attachment to the device with the setup taking just under a minute. Both arms can be treated simultaneously or individually. The system has an independently adjustable weight support system around the elbow and wrist. This extends the range of movement but also improves coordination and reduces evasive movements. This means that even the weakest of arms can be supported to carry out challenging therapy exercises. 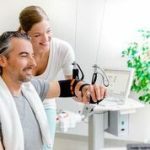 Therefore, whatever the stage of your rehabilitation you can start to improve the strength and control around the upper body, shoulder and elbow with motivating and engaging activities. 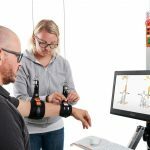 Diego, the intelligent arm rehabilitation device for patients of all ages. In all phases of the arm rehabilitation. 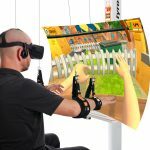 Therapy with DIEGO is varied: interactive therapy games provide audiovisual and haptic feedback; you will experience movement in virtual reality. This motivates and enables a greater number of repetitions, that is essential for movement and neuroplasticity.This, in turn, ensures motivation is maintained. In addition, every therapy module is equipped with different levels of difficulty. Therapy at the maximum performance of the patient is possible in all phases of rehabilitation. In order for success to be made visible to you, the course of therapy (results) are recorded and can be called up at any time to help you see your progress. Arm therapy with DIEGO makes the rehabilitation process more varied, motivating and goal-oriented. The DIEGO incorporates full immersive Virtual Reality (VR) into therapy programmes to enhance treatment outcomes and promotes function.